Sooner or later, your toddler will start sleeping poorly without a pillow. When that happens, you might reach out for a pillow next to you and place it under his or her head (which may not be a smart thing to do, as we’ll see later) or you might buy a toddler pillow, a head rest designed specifically for little angels. Toddler pillows come in as much variety as adult pillows, and knowing which one to buy can prove a challenge in itself. But, don’t worry, our review of best pillow for toddlers will help your choose right. First, however, let’s learn when is the right time to buy a pillow for your baby and things to consider when buying one. Why not use a regular pillow for a toddler? Regular pillows﻿﻿ are designed keeping in mind the size of an adult head, neck, and shoulders, and so they're typically not great for toddlers. Using a regular pillow for your toddler could put unnecessary strain on his or her neck area and may lead to discomfort and poor sleep, or, worse: poor posture. When is the ‘right’ time to introduce a toddler to a pillow? There are different opinions on this. Some experts opine the right time is around the age of 18 to 24 months, a period when most toddlers leave the crib and start sleeping on the bed. However, if you ask other parents, you are sure to find many who introduced their little ones much before and many who introduced their toddlers much later without a hitch. Actually this is not surprising at all. Different toddlers develop and behave differently, and the right time for one may be a bad time for another. The body of a toddler also gives indications. For example, when the shoulders are wider than the head, the toddler is likely to be more comfortable with a support under the head. The purpose of placing a pillow under a toddler’s head is to make him more comfortable. If your baby is sleeping fine without one, even when he or she has transited to a bed, there’s no need to use a toddler pillow. Keep watching your baby for the above indicators, and when he or she shows them, introduce him or her to a pillow. Needless to say, if your toddler is allergic to a particular material, you shouldn’t buy a pillow of that material, because the allergy may become worse. You might also want to consider hypoallergenic pillows, which are made of materials that help reduce allergic reactions, even if your baby in overly sensitive to dust mites, mould, etc. The immune system of toddlers is not as strong as ours, so playing it safe might be the best thing. Too much comfort is likely to mean less than optimal support and vice versa. Opt for a pillow that offers both in reasonable proportions. Many, but not all, toddler pillows offer a guarantee. While some offers only a few months’ guarantee, some other offers a warranty period of couple of years or more. What all is covered in the guarantee may vary from maker to maker, but most cover loss of shape, torn seams, and poor workmanship. A longer guarantee is a sign that the maker stands behind the product, and so may indicate better quality. The most common material for the pillow cover of toddler pillows is cotton, available in organic and non-organic variety. I like organic fabrics, especially when it comes to my little one, because toxins and harmful dyes and bleaches are not used in them. Organic cotton pillow covers come with a marker. Check for it when buying an organic cotton toddler pillow cover. Besides 100% cotton, other common materials include synthetic fiber and cotton polyester blend. Many different materials are used for filling toddler pillows, the most common being the following: down, feathers, memory foam, and synthetic fill. Each filling material offers unique benefits and perhaps also disadvantages; for example, feathers pillow are soft, but not the best option for a toddler with asthma. Similarly, synthetic pillows offer a good balance between comfort and support but can make a crunching sound whenever the sleeper moves. Some toddler pillows can be washed as a single unit. Throw the pillow into the machine for a full cycle and it will come out as good as new. On the other hand, in some pillows only the cover is washable. You might want to opt for a zip-off cover, as it is easier to take off and put back on, if you are opting for a the second type. This pillow is not too firm or too soft. It is just about the right firmness for a toddler. That it is easy to travel with is another advantage. The cover used is made of cotton sateen, which is softer and quieter to touch than the normal 200 thread count 100% cotton cover. The pillow is washable and also comes with a 3-year warranty against losing its bounce. The warranty shows that the manufacturer backs its product. 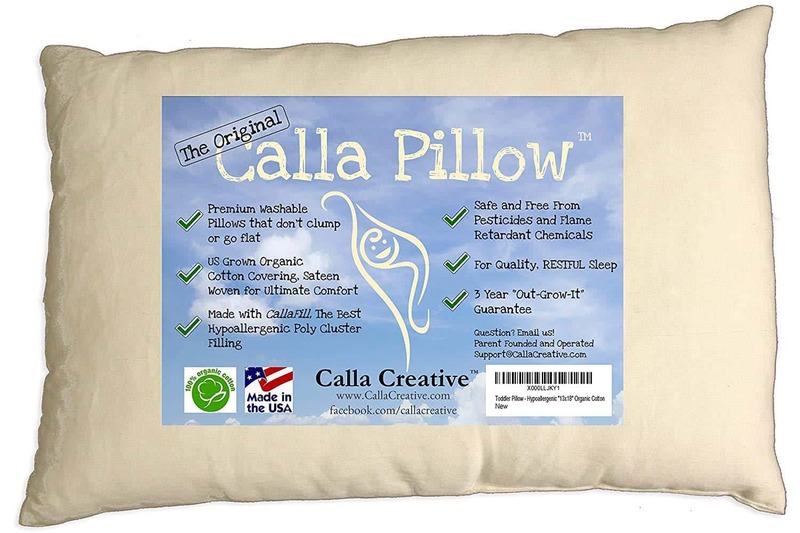 The Calla Pillows are made in the USA, and the cotton used is sourced from certified organic farms. If you prefer purchasing products made in the country or made with organic materials or both, you might want to give this product a serious consideration. The pillow is hypoallergenic, so no worries on the allergy front. This is a quality toddler pillow and I couldn’t find any shortcomings. The price, however, is a little steep. While searching, I found several toddler pillows that were made in the USA as well as a few that were recommended by chiropractors. This, however, was the only one that was both. It uses less filling than many other toddler pillows to prevent a kink in the neck. It is not very fluffy but is super comfortable. A free pillowcase is included with this toddler pillow—and that’s something. Often, it is hard to find a perfectly-fitting cover for toddler pillows which come without the cover. It is machine washable and hypoallergenic, two absolute must features to look for in a toddler pillow. The pillow comes with a 6-month guarantee. You can return the product and get a replacement or full refund within this period if you are not happy with the purchase. 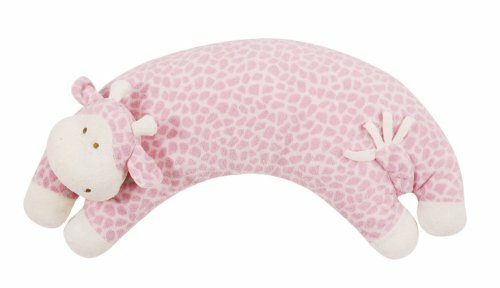 This is almost a perfect toddler pillow, comfortable, chiropractor-recommended, machine-washable, hypoallergenic, and backed by a 6-month guarantee. The only gripe I have is that the cover has a low thread count. It is comfortable, but not as much as a few others. This is a good size for toddlers. And the good thing is that the company has an excellent replacement record and customer service. If you find the pillow is a little too thick or thin for your toddler, as it happens so often with toddler pillows, you can quickly get it replaced. This pillow maintains a good air flow. You won’t have to worry about your toddler feeling warm lying over it. It is also hypoallergenic and machine washable. The surface of the pillow is soft to touch, even without a pillowcase. 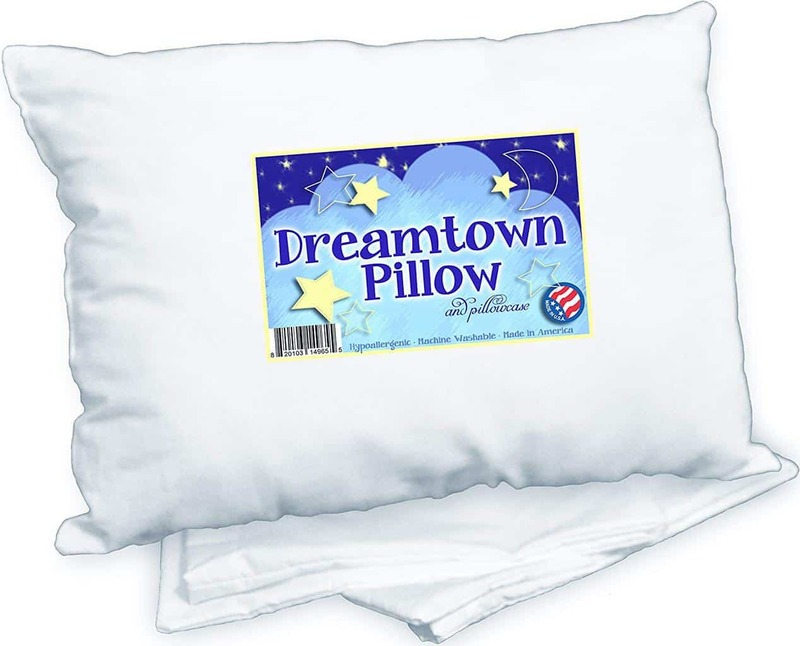 If you want a pillowcase, you can order it separately through the company’s website. This pillow is made in the USA. For some users, where the product is made is a no issue. However, to some it does matter. 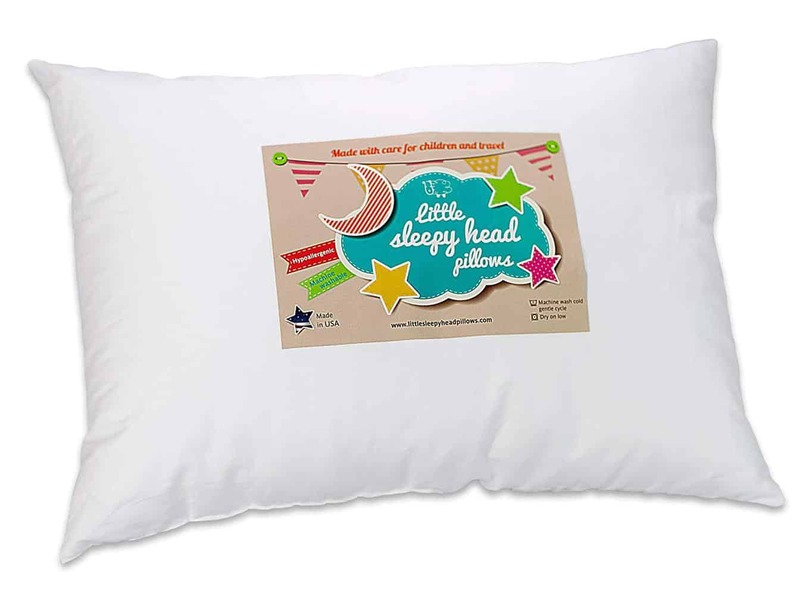 If this is important for you, you might want to give the Little Sleep Head Pillow a try as it is also a good toddler pillow. 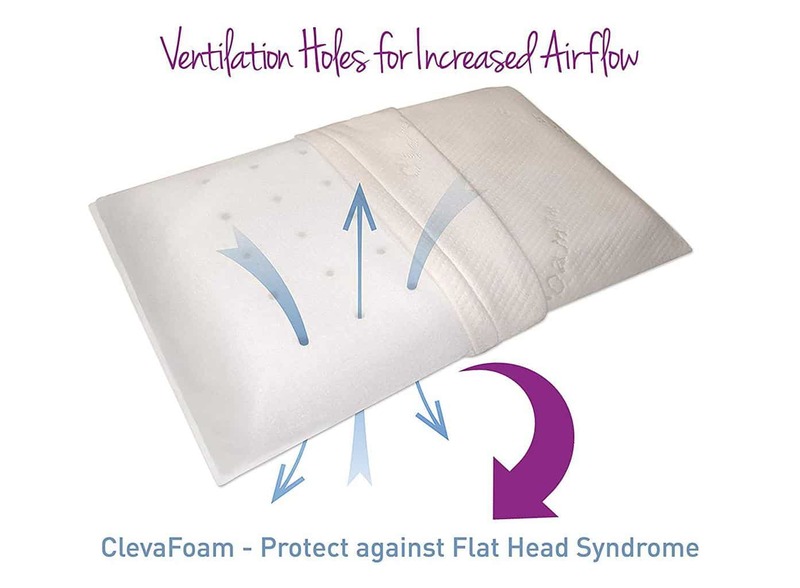 Made of a single block of memory foam, The ClevaFoam Pillow is a thin toddler pillow. And that’s one of its main advantages. Many toddler pillows are way too thick and are especially unsuitable as the first pillow for your toddler. This one fits the bill perfectly. It’s thin, but that doesn’t mean it doesn’t provide good support, because it really does. And as it is made of memory foam, it also contours to the head and neck of your baby, negating any risk of a neck kink. The pillow breathes well and effectively draws away the moisture, keeping the child comfortable and cool. It is also washable, although nothing about this mentioned in the product description. I’ve washed it 4-5 times since the purchase and there’s been no problem. There’s no pillowcase included. While many toddler pillows come without a pillowcase, you might feel its absence more in case of this pillow, simply because normal toddler pillowcases do not fit it. The other problem is the smell. It is strong and takes time to fade away. Other than these two issues, the ClevaFoam Pillow is a pretty good option. Your child will love this pillow. Whether he or she will use it more as a play toy than a sleep pillow is altogether another thing. This pillow is cute. A child would not be able to keep himself or herself from cuddling it, and so wouldn’t you, at least once or twice. As far as its assessment as a sleep pillow goes, it is very soft, which surely is a positive. It cuddles the head very gently. One thing is for sure. If this pillow is in the room, your kid will not take only this one when he or she goes to sleep. My 20-month old son uses this pillow entire night daily without a problem. However, because of the shape, some kids may nudge it away mid sleep. The cover is washable and mine has held up well after multiple washes. However, there is no information of it being hypoallergenic or not.